Well, there’s a surprise. This morning, Prime Minister Theresa May announced that there will be a snap General Election for June 8th 2017. Or rather she didn’t. Not quite. Under the Fixed-Term Parliament Act the government must win a two-thirds majority in the House of Commons in order to call an early election. That vote will be held tomorrow. However, ‘Leader of the Opposition’, Hereby Corbyn has for some reason welcomed the move so it seems likely the vote will be carried. Unless, that is, a significant number of Labour MPs defy him. We’ll see. 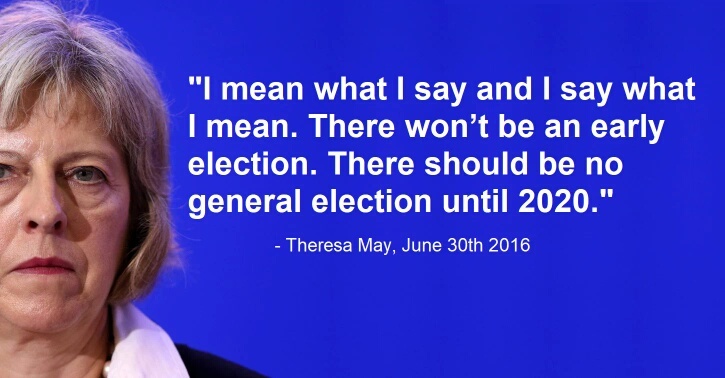 In her short speech the PM stated that she was calling an early election because Parliament was somehow obstructing her plans for BrEXit. That’s a surprising claim, since the main opposition party voted for triggering Article 50 of the Lisbon Treaty and has actually done precious little opposing of any kind. So that argument makes little sense to me. Moreover in 2016 when she came to power, Theresa may stated adamantly that there would be no early General Election. So why the change of heart? My theory is that the results of the criminal investigation into fraud by the Conservative Party at the 2015 General Election are about the be announced, and the PM doesn’t want to endure a wave of by-elections in marginal constituencies won by dishonest means. Hence the hasty decision to neutralise that threat. Unless there is tactical voting on a massive scale it seems likely that the Conservative Party will win the forthcoming General Election with a large majority. A big turnout from young people might shake things up too. I hope everyone who is eligible will register to vote and cast their ballot on the day, tactically if necessary. The Conservatives are treating this country like their private playground and I would be more than delighted if this gamble backfired on them. I have to say, though, that I’m not optimistic.